​The first inter-party presidential debates in American history (televised or otherwise) took place between John F. Kennedy and Richard Nixon in 1960. The debates hold a special place in American political lore, not only for giving rise to a rite of presidential passage, but also for affirming the impact of television on politics. Kennedy, the story goes, was ready for prime time, choosing to wear a dark suit to stand out in front of the gray background of the debate stage, enhancing his natural charisma. Nixon, meanwhile, looked ill, undercut by a lingering fever, a drab gray suit, and a sweat-inducing coat of drugstore makeup. Significant as it was, the Kennedy-Nixon contrast played out in black and white, as fewer than two percent of American homes had a color television in 1960. By the time Jimmy Carter and Gerald Ford took the stage in 1976 – there were no debates in 1964, 1968, and 1972 due to candidate preference and TV’s equal-time provisions – 74% of American households could watch in color, ushering in a new era of political symbolism. We looked back at every presidential debate in the color television era to see what the candidates wore, paying particular attention to the color of their ties (or suits for Hillary Clinton). Heading into 2016’s final debate, that makes 28 debates and 59 candidates since 1976. We also looked at who won each debate, per Gallup, and which color fared best. And we highlighted some debate-fashion superlatives and faux pas. In total, 36 of 59 candidates (61%) donned a red or primarily red tie on the debate stage – 18 Democrats, 17 Republicans, and one Independent. Sixteen of 59 (27%) wore blue – six Democrats, eight Republicans, and two Independents. Five (8%) wore even-colored patterns, one (2%) wore gray (shout out to Bob Dole in 1996), and one (2%) wore brown (Ronald Reagan in 1980). 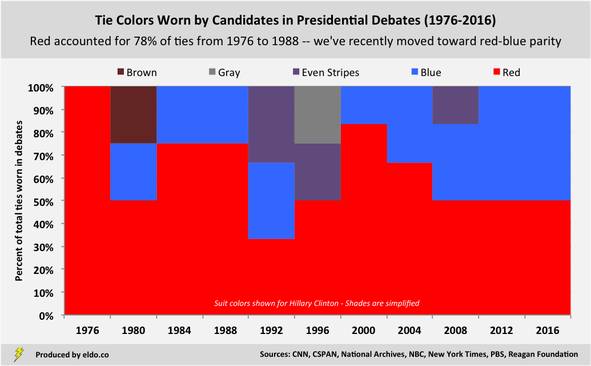 From 1976 to 1988, red was effectively the norm – candidates wore the color 14 out of 18 times (78%). Carter and Reagan first bucked the trend in 1980. Tie colors have balanced out since, save for a red resurgence in 2000, when Gore wore it twice and Bush wore it thrice (once with diamonds). From 1992 to 2016, we saw red 22 of 41 times (54%), blue 13 of 41 (32%), even patterns five times (12%), and Dole’s gray once (2%). Seeing one candidate in red and the other in blue did not become a debate-stage norm until after the 2000 election, when red states, blue states, and party colors became a thing – though tie colors have had little, if anything, to do with party. In fact, starting with Obama-McCain II (2008), the parties have simply alternated red and blue. Since 2004, the lone exceptions to the red-blue paradigm were Bush-Kerry III (2004), when both wore red, and Obama-McCain I (2008), when McCain wore a candy cane tie. From 2004 to 2016, red accounted for 12 of 22 colors (55%), blue for nine of 22 (41%), and McCain’s stripes for one of 22 (5%). 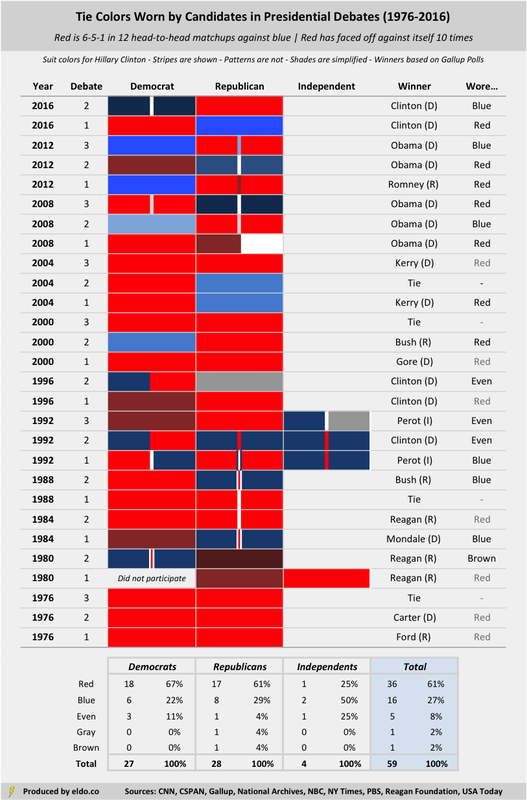 Red and blue have faced off on the debate stage 12 times – the candidate in red won six of those contests, the candidate in blue won five, and one was considered a draw (Bush-Kerry II in 2004). Results, of course, have far more to do with the candidates than their outfits, so we wouldn’t read too much into them. Red went up against itself ten times. Even stripes were involved in five debates, winning three, including two in 1992. By "color television era", we are referring to 1972 onward, when most American households had a color television set. With the following exceptions: Bush-Dukakis II (1988) is anecdotal; Bush-Dukakis I (1988) is based on a CBS News Poll and a Gallup Poll, both via the New York Times; Reagan-Anderson (1980) and Reagan-Carter (1980) are based on CNN descriptions; Carter-Ford II and III (1976) are based on descriptions from CNN and The Making of a Nation. Note that Kerry outpolled Bush by two percentages points in their second debate in 2004 and Gore outpolled Bush by two percentage points in their third debate in 2000. Both fall within Gallup's stated margins of error and are thus marked as ties. Certain polls are USA Today / Gallup Polls. President Obama's tie in Obama-McCain II (2008) is occasionally referred to as gray. Though light, I believe it is safely blue. Then again, we all learned an important lesson last year about how people can perceive different colors in the same piece of clothing.